Originally due to be finished this year, it seems that all construction has come to a halt at the Arahman Mosque in Baghdad. The place is absolutely colossal, and the fittingly large cranes used in the construction can still be clearly seen at maximum zoom. Incredible image though, and make sure you check out this ground-level one too. 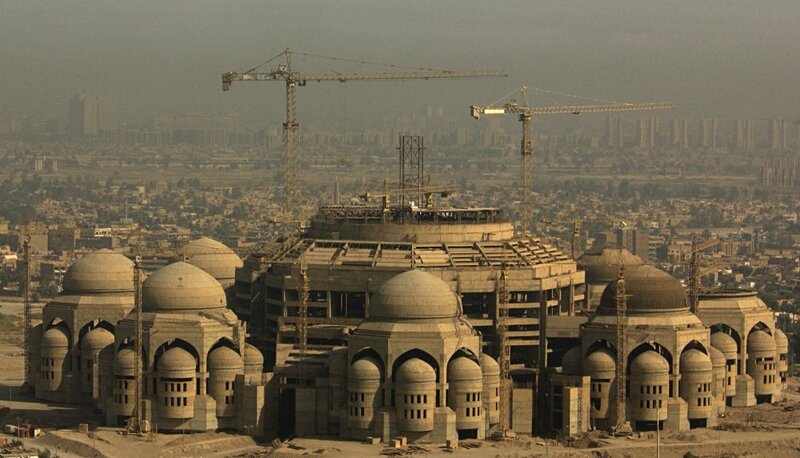 Just to the north is the much-further-from-finished, but still worth a peek, Grand Saddam Mosque, which was originally slated for completion in 2015, but which I don’t suppose will ever get built now. Thanks to woowoowoo and david. Several things: Is it my imagination but do Baghdad’s main highways have unusually black tarmac? Also, Arahman mosque looks like it is being built in a once heavily populated area and a whole district has been cleared to build it. I hope the residents got the appropiate reperations (yeah right!) It looks like a fascinating city and there are are loads of massive buildings and structures but this one looks particularly interesting- any ideas? As it happens Northern Git, yes I do 😀 It’s the Monument of the Unknown Soldier, previously posted here back in August. Shame on Bush to have destroyed this town, his culture and his inhabitants for oil. Maybe 2000 american soldiers died (I think more) but how many iraki died ? nobody take care about that. Probably one of the largest monuments to state corruption in the world. Consider: the Ba’athists were spending huge amounts on grand projects like this and getting rich via the oil-for-food program, while Iraqi ordinary citizens who that program was supposed to help were growing increasingly impoverished and hungry. Whatever happened after the overthrow doesn’t change the realities of the circumstances under which this thing was built.